Cabela’s, in Hoffman Estates, Illinois. The Enterprise has departed the “alternate construction bay” and is now officially in service. That’s a nerdy way of saying that while a few niceties remain to be addressed, all functional systems have been completed and final debugging must now take place on the road. I pulled the Mighty Innsbruck out of the driveway I was parked in, and had the boys at General RV in Huntley IL grease the wheel bearings and look over the associated bits. I like to think of this interstate foray as an adventure, but would like to keep it as positive an adventure as possible. Dry bearings, dragging brakes or bad tires can put a serious dent in one’s touring experience. What confidence did I have that they would catch obvious problems? The Profit Motive. The more legitimate problems they can find, the more money they can make. I was relieved when they liked what they saw and gave it a clean bill of health. From there, I went to Cabela’s in Hoffman Estates and parked overnight in the RV section of their lot (with their permission). With both fresh potable water and a free dump station here, this is my kind of place. They even have outside horse stalls and dog kennels set up for temporary use. My old Radio Shack indoor/outdoor thermometer crapped out, so I’ll see if Cabela’s has a similar unit in stock. The weight of my books, batteries and stowed solar panels in the front of the trailer is both bad news and good news. The bad news is that the hitch ball on the tow vehicle needs to be raised a peg or two to keep the trailer more level, and in general, a substantial tongue weight can cause handling problems. The good news is that the F-250 doesn’t seem to care – handling remains solid. 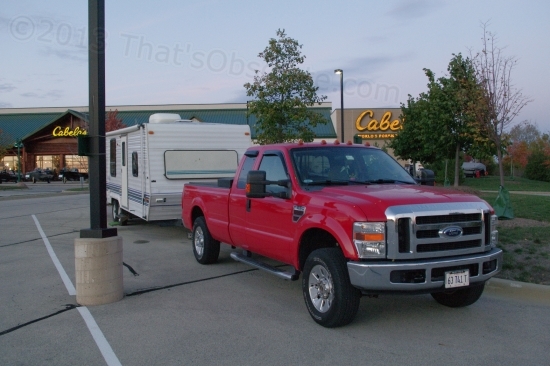 The F-250 is designed and equipped to handle it, while the camper is not. There’s no need to tear off the trailer hitch receiver from overload, but I will keep an eye out for a commercial weigh station just to see where things stand by the numbers. Also, a slight list to port that the trailer had has disappeared due to the batteries and panels being stored on the starboard side, probably evening out the weight of the lopsided kitchen appliances.